Grains seeing a little pressure this morning. Beans down 1 ¼ cents, corn down ½ cents, and wheat down 4 cents. USDA report is out tomorrow, Friday 2/8, and will include Dec quarterly stocks, final fall harvest production yield, January delayed reports, and wheat planting intentions. No new U.S. China news outside of next week’s talks in Beijing. 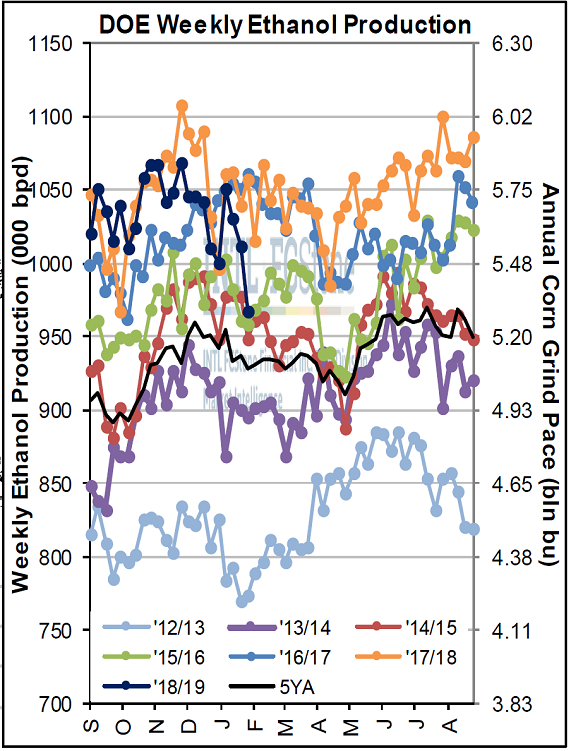 Total U.S. fuel ethanol production declined for the third straight week last week, falling off a cliff within an environment of negative margins and horrible Midwest winter weather, to 967k barrels per day on the seven days ending Feb 1. That was down from 1.012 mln bpd last week and 1.057 mln bpd on the same week last year. It’s tied with the week ending 10/6/17 as the lowest single week in more than 2 1/2 years. Cumulative output since 9/1 (now 1.034 mln bpd) continues to slip further behind last year’s pace.